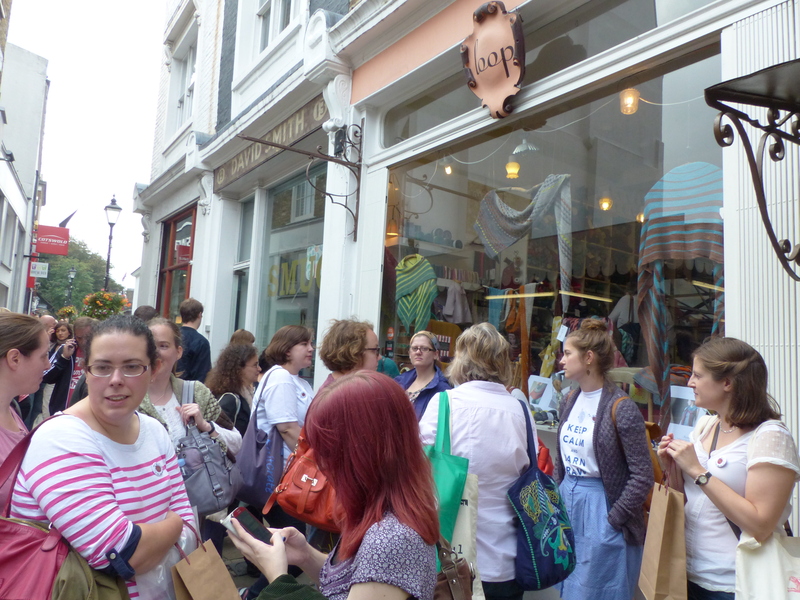 Out and about in London yesterday (20 September 2014), there may have been higher concentrations of yarn fumes than usual, as over 100 knitters, crocheters and spinners took part in the Great London Yarn Crawl. Nine groups, shepherded by intrepid volunteer leaders, travelled different routes around the city. Each group visited four yarn shops, knitting on public transport as they went and ending up at Kings Cross for the after-party. I was part of Team Cheviot, a lovely group of yarn enthusiasts from London and further afield. 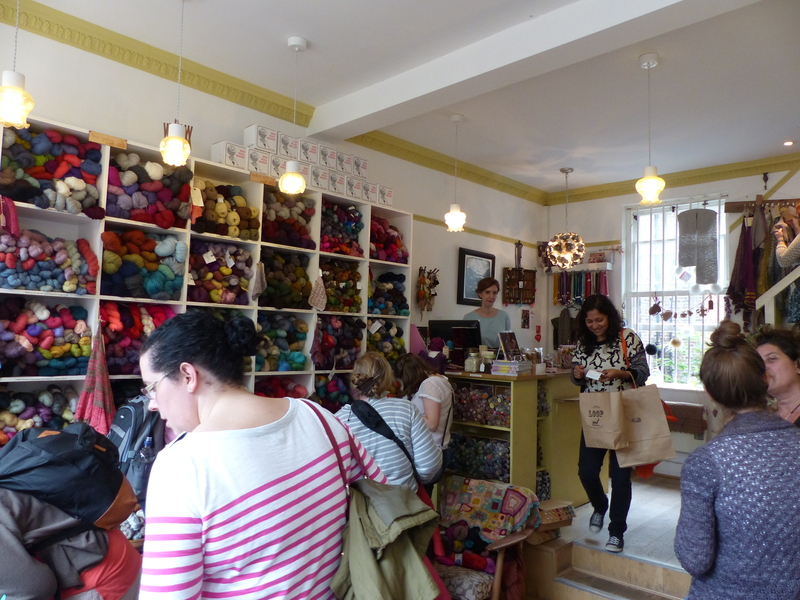 We met in Lazy Social on Stoke Newington High Street for some pre-Crawl caffeine and knitting, before visting our first shop. We were also given our goody bags, which contained beautiful mini-skeins from Countess Ablaze, Lioness Arts and Whimzy, a skein of Rowan yarn, a project bag tag from Kettle Yarn Co, beads from Inspiration Knits, a Pom Pom Quarterly badge, a pattern from Rock and Purl, a sample of Soak and vouchers from some of the shops taking part. Team Cheviot also received a special gift from one of our team members: a mini-skein of yarn which she had dyed and spun from Cheviot wool (mine was the lovely pink skein below). So even before we started we had each amassed a very respectable haul. Our first shop, Knit With Attitude (also on Stoke Newington High Street) gave us a fantastic welcome to start off the day. 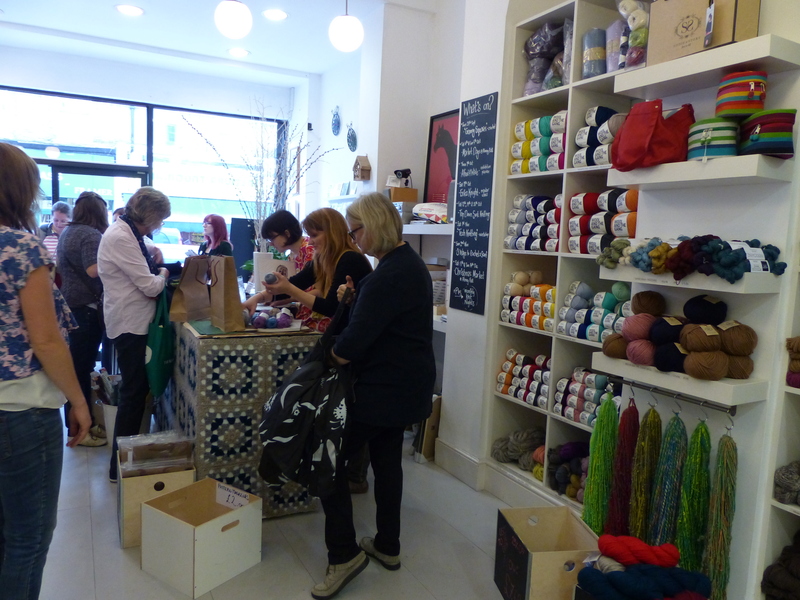 They had a lovely selection of yarns and some other more unusual objects such as gorgeous handmade ceramic buttons and giant knitting needles! They share their space with another shop, Of Cabbages and Kings, who sell beautiful prints, pictures and cards, and we enjoyed having the run of both shops. From Knit With Attitude, we made our way to our second shop, Prick Your Finger in Bethnal Green. Prick Your Finger is a tiny treasure trove of a shop, with yarn, vintage buttons and patterns, notions, and yarn-inspired art covering virtually every surface. 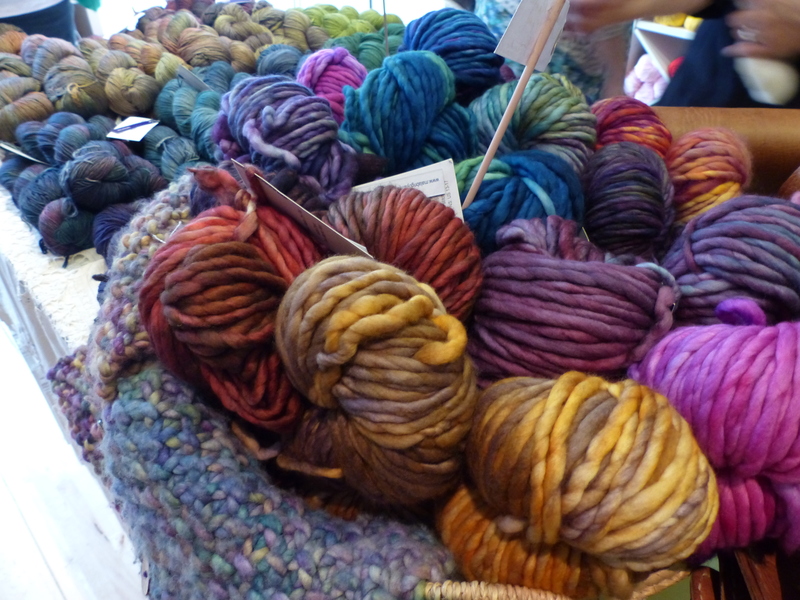 Everything in the shop is made in the UK, and much of the yarn is hand-dyed by the owner. After Prick Your Finger, we headed for Islington and had some lunch in a pub close to our third shop: Loop. 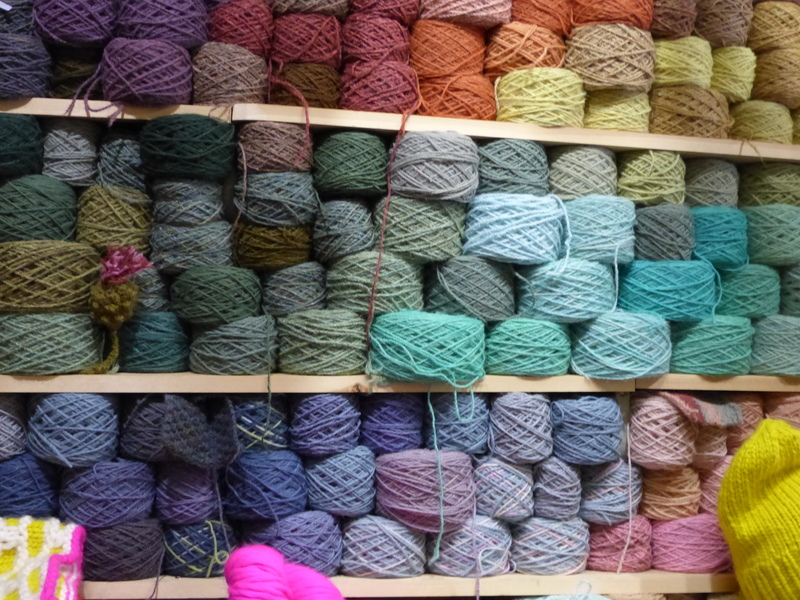 Loop is a bit of a London knitter’s institution, known for its diverse selection of beautiful yarn from all over the world. It’s probably the closest yarn shop to where I work, so I know it well, but it’s always a pleasure to visit there. By that stage, Team Cheviot had bonded to the point where we were making colour choices by committee and several members of the team enlisted the help of the whole team to chose beautiful yarn in Loop to make sweaters. 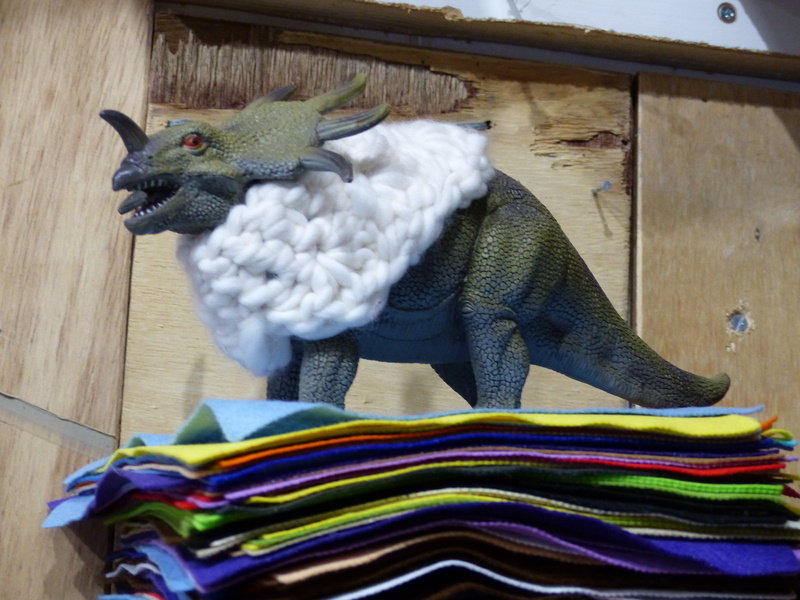 Some vowed to wear their finished sweaters on the yarn crawl next year! We also bumped into another Yarn Crawl team outside as we left. 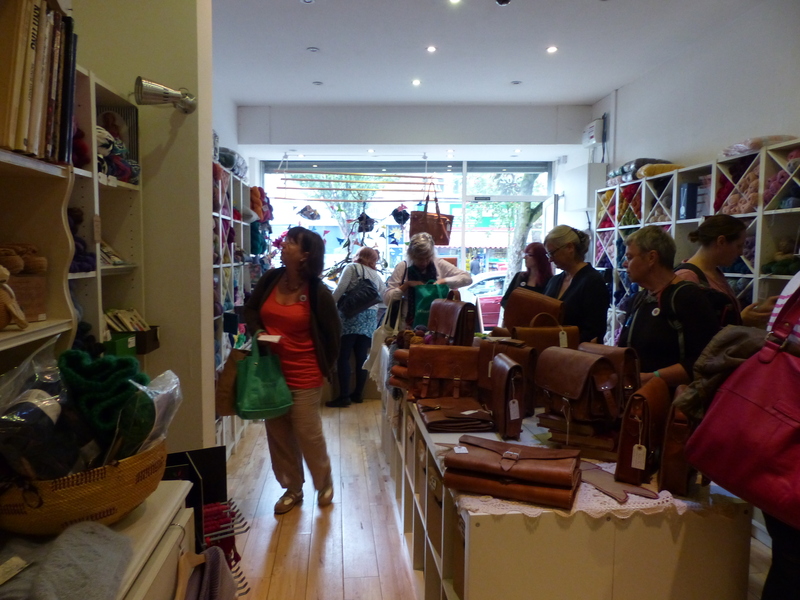 Our final shop of the day was Nest in Crouch End. Nest has a really wide selection of yarns and also some great non-knitting gifts such as pretty brooches and Moroccan handmade bags. It’s a really friendly neighbourhood yarn shop, with a big table at the back where we were very glad to have a cup of tea and a rest with our knitting after all our shopping. Revived by the tea at Nest, we made our way to the after-party at The Parcel Yard in Kings Cross, organised by Pom Pom Quarterly magazine. As well as a quiz, there were lots of door prizes and a raffle to win a basket of yarnful goodness. The room was soon full as all the teams made it back and people caught up and compared experiences (over the gentle background hum of knitting needles). It was lovely to see people I first met on the GLYC last year, as well as other knitting friends, and also to relax with my team over a few drinks. We were delighted that four members of Team Cheviot won door prizes. And of course, the whole day had been in aid of the domestic violence support charity, Refuge. The final total raised is yet to come in, as there were lots of raffle ticket sales on the night, but as well as raising money, the GLYC had been asked by Refuge to donate handknitted items for women and children affected by domestic violence. 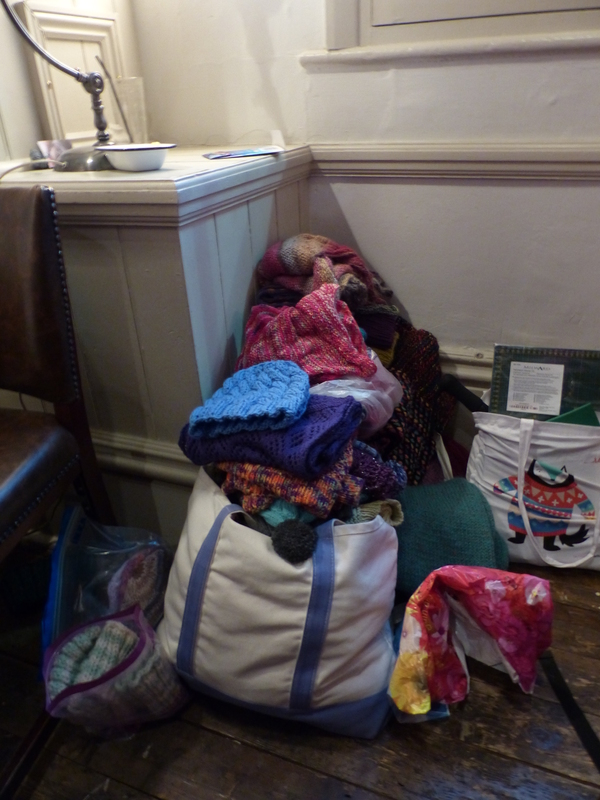 By the end of the evening, there was a huge pile of hats, scarves, mittens and other cosy handknits which had been donated. Some items were even finished at the party! Thank you to the organisers, volunteers and sponsors who helped to make the yarn crawl happen. I had a fantastic day, and it’s great to know that others will also benefit from our adventures in London. 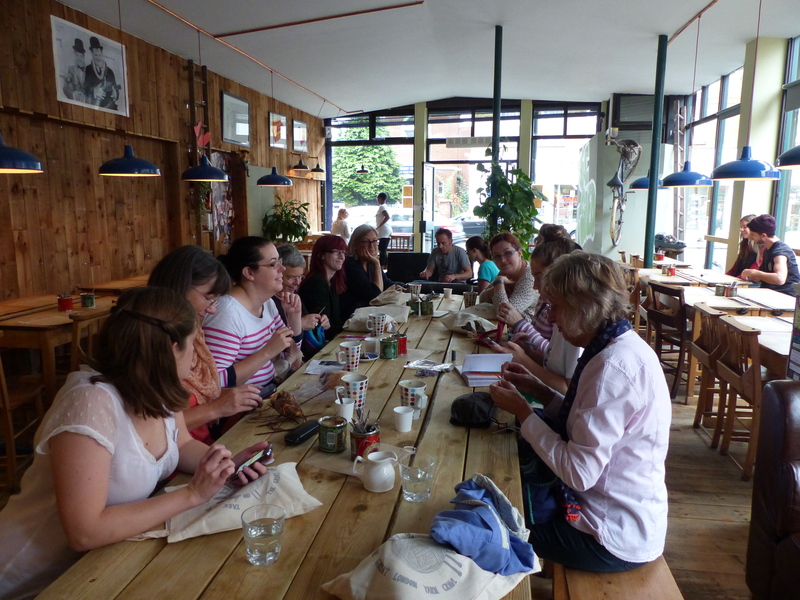 The Great London Yarn Crawl organisers, Allison and Rachel of Yarn in the City, have exciting plans for next year. I can’t wait to see what they come up with. 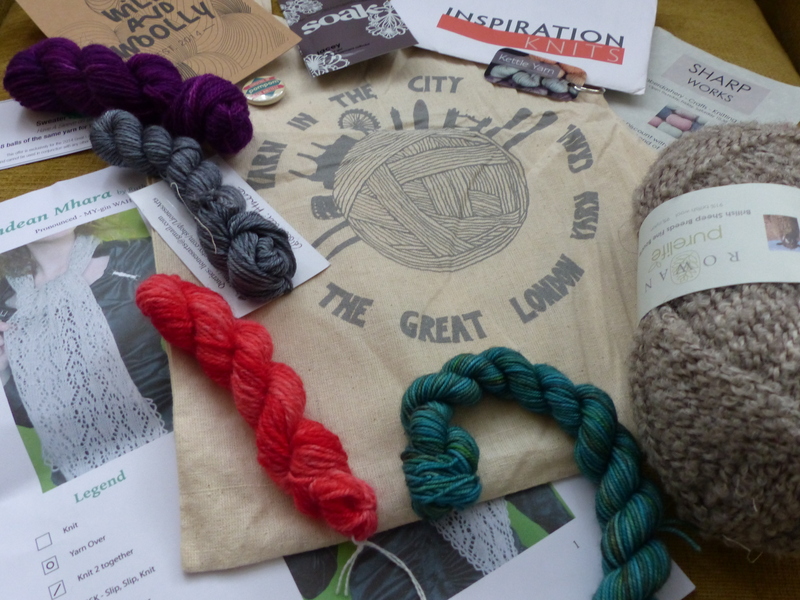 This entry was posted in Uncategorized and tagged GLYC2014, Great London Yarn Crawl, Knit With Attitude, London, Loop, Nest, Prick Your Finger, Refuge, Team Cheviot. Bookmark the permalink. Thank you so much for a delightful blog, it has provided a clear record of last Saturday, so pleased you took photos in Nest, I forgot completely. My thanks are to you, and all the Cheviot team for your friendliness and kindness to me for I did wonder what I had done signing up, real life socialising can be difficult for me compared with chatting in Ravelry and on message boards.